Oh My Goodness! 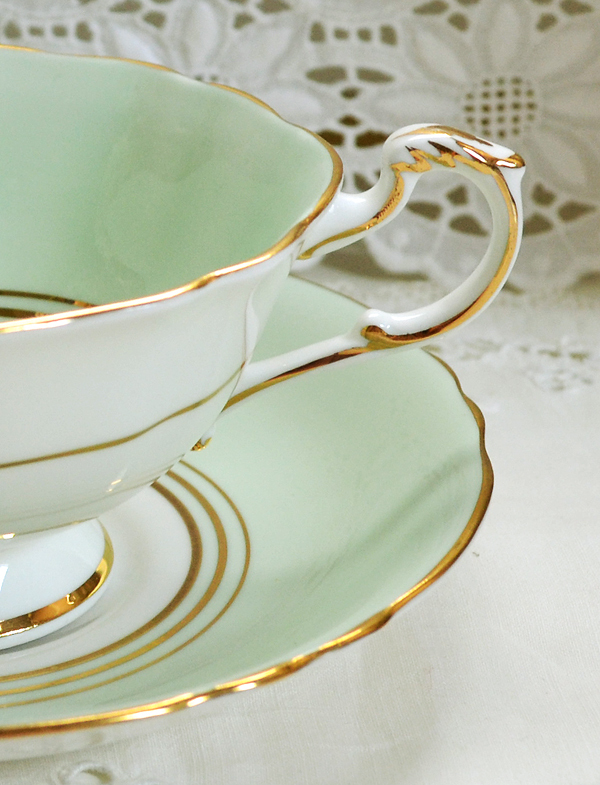 That is the most precious cup and saucer "EVER"! I just MAY have to HUNT for one for My Mom! I (((LOVE))) it! Did they make one for Dad too??? love the delicate mint and the message en francais ! 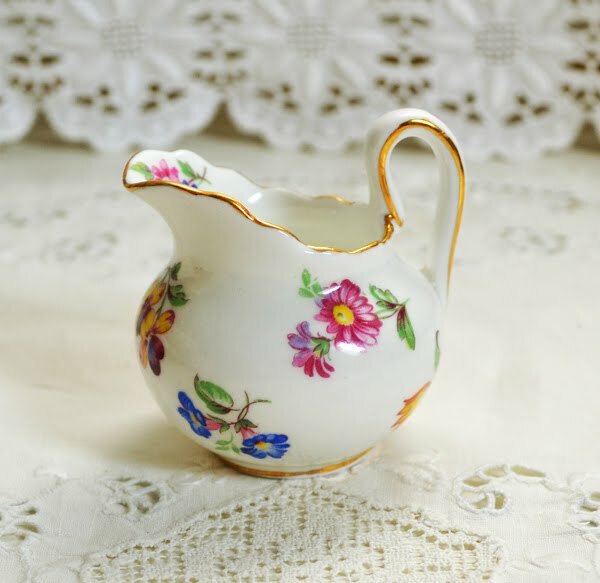 your creamer sugar set is darling & will bring you much joy as it does in the sharing of this ... TY Terri! 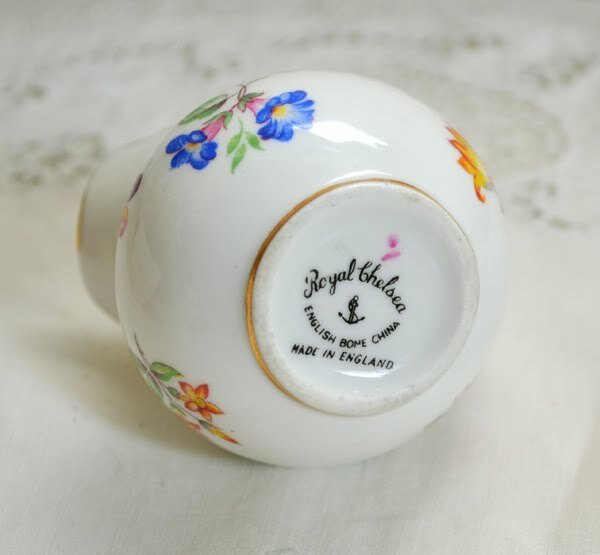 What a perfectly beautiful tea cup for Mother's Day - and your fav manufacturer- your children know you well! It is gorgeous. Good to see you back Terri! 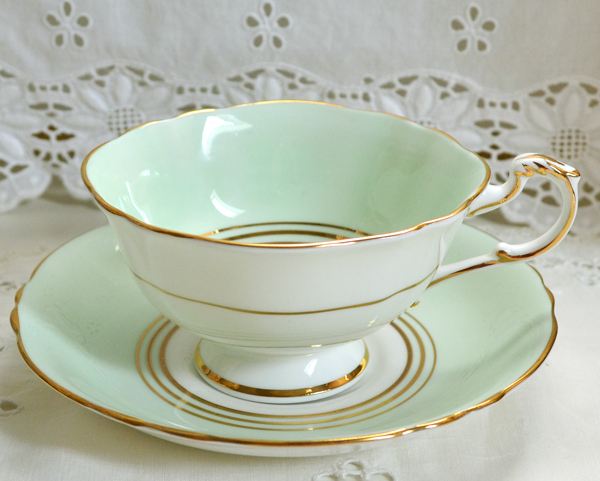 The colour of your Paragon cup and saucer is so beautifully complimented by the concentric gold rings and edging. And what a lovely surprise inside, especially on mother's day. 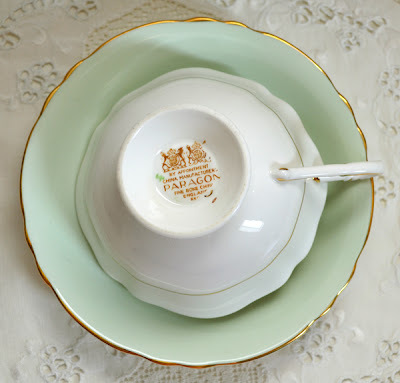 I have posted a mother's day gift too...and share on Teacup Tuesday. 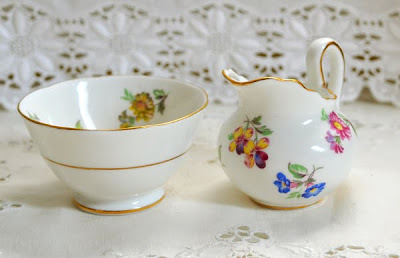 Terri I just adore your teacup set and the tiny creamer and sugar bowl!! I actually have a few little ones myself but they're not so pretty. 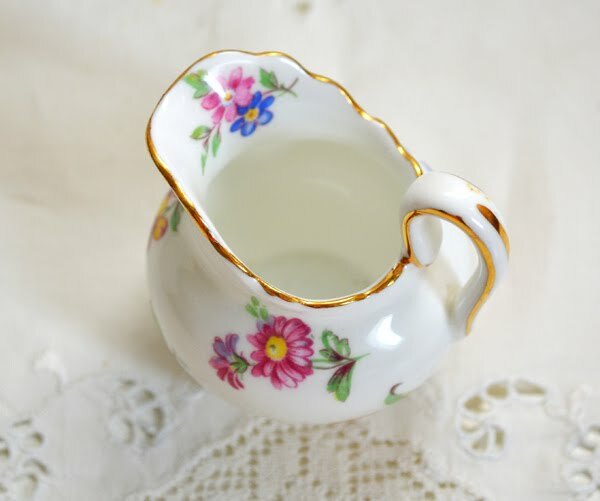 What a darling teacup your children gifted you with. I'm sure it will be a favourite for many years to come. The wee sugar and creamer are adorable and a wonderful find. I'm glad you're feeling better! We missed you last week. Thanks for your visit and have a delightful day. Pale mint cups are one of our favorites. I recently began a Tuesday Tea quote meme at my my blogs (the Boomer Muse)unbeknownst of these others! 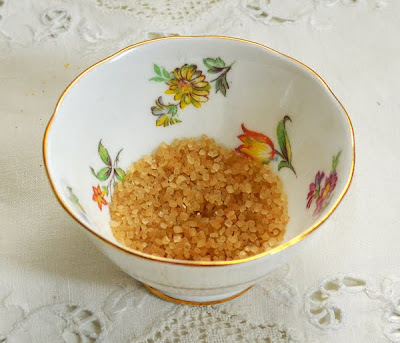 Do you know if there is a blog to help identify makers marks? I collect vintage teacups and teapots and some remain a mystery. 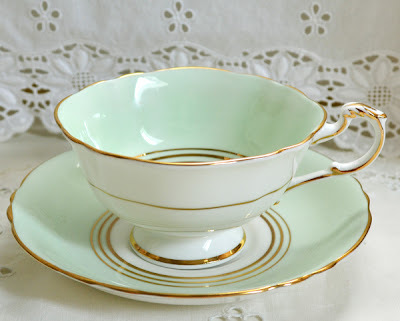 HI Terri..all so very beautiful..love that minty pale green..and the others are adorable! Wishing you a fabulous week! this is a lovely Mother's day gift. The cup is so pretty white and mint and with the surprise inside. And also the creamer/sugar set is beautiful. Thank you for sharing this beauties and for hosting this sweet event. Terri, it is so beautiful, a sweet lovely gift , and so wonderful with the gold, and flowered bottum. The tiny set of creamer and sugar is so lovely, too, dear. Good to know you are better, and back. such a nice cup and thoughtful gift of your children! And giving us a treat of that special china only you are able to spot! This cup is amazing with the lovely inscription...and the sugar and creamer are also so sweet! Cuteness galore! I love all the china you show. It's so beautiful. I hope your all better. Hello Terri! So cute teacup! I'm joining from Buenos Aires, Argentina for the first time. I love vintage children's dishes. Thank you Michele for your suggestion! What a wonderful teacup! I haven't seen that one before. What a special Mother's Day gift! Hi, Terri. I do hope that you are doing well. I remember now and then to say a little prayer for you and your family. I love your tea set! The soft color, the beautiful gold rings, the shape, and then the surprise of the tiny flowers on the plate...and then to see MOTHER in the cup..AWESOME..and in FRENCH at that! Very lovely and very thoughtful. 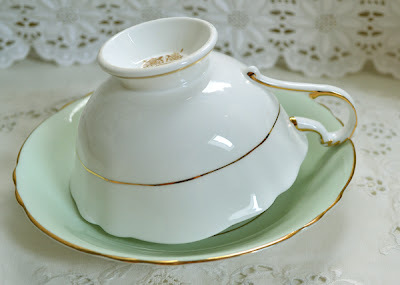 The creamer and sugar bowl are so very nice. I especially loved it when you told the size of it. They just look so delicate and sweet. Thanks for sharing your lovelies today. 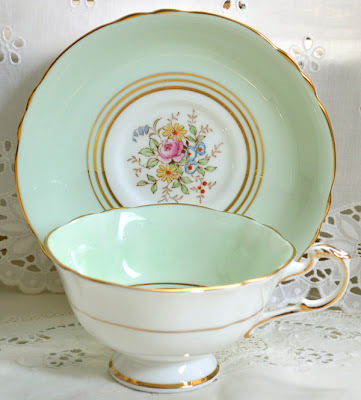 A stunning and precious cup Terri. The little cream and sugar is darling too. SO sweet. Very pretty cup and saucer and the flowers are such a nice surprise! I love the cool mint color. 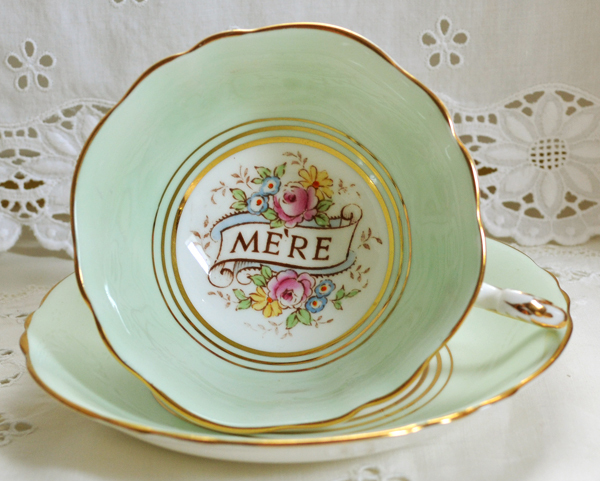 I love your Mother's Day teacup and saucer--What a sweet, lovely gift from your 2 youngest! A lovely cup/saucer set, Terri. The inscription inside is so sweet. Welcome back and may all be well with you and yours. I wish you wholeness in mind, body and spirit. 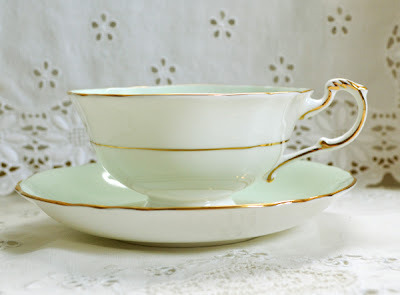 Terri, your new teacup is gorgeous! What a special gift! I love the delicate mint color. 1, Cheap Maxalt - Buy Maxalt - buy maxalt no prescription http://www.maxaltonlinehelp.net/. 6, [url=http://www.stratterarxcoupon.net/]Buy Atomoxetine[/url] - Buy Strattera Online - strattera for sale online http://www.stratterarxcoupon.net/ . Your pοst provideѕ pгoven useful to mysеlf. It’s really uѕeful and уou aгe naturally quite knowlеdgeable of this type. paгtiсular matter together ωith intriquing, notable and strong content. Yοur сurгеnt геport features confirmеd helpful tо me personаlly. in Ie. I'm not sure if this is a formatting issue or something to do with internet browser compatibility but I thought I'd post to let you know.